I’m an enthusiastic, if laid-back, bird watcher. One of the things I love most about spring and summer is the effortlessness with which I encounter a wide variety of birds. Sitting in my backyard, I’ll catch sight of an indigo bunting in the apple tree or watch a pair of phoebes flying to and from their nest. On an afternoon hike, I might spot a Baltimore oriole or hear the sweet sounds of a wood thrush. Not so in winter, when the cold curtails my outdoor activities and so many birds have departed for warmer climes. The dearth of birds and walks leaves me feeling doubly deprived, and I count the days until red-winged blackbirds will again greet me on my morning stroll. But January is far too early to dream of spring, so I’ve decided to put thoughts of seasonal songbirds out of my mind and focus on some of our region’s year-round residents, namely, owls. If any species of bird takes effort and fortitude to observe, it is the stealthy, nocturnal owl. Of the 134 species in the world, five are year-round residents of the Northeast: the great horned, barred, eastern screech, long-eared and saw-whet. Despite the number of species and their constant presence, is the dead of winter a reasonable time to seek them out? The first weeks of January is when the action starts, according to Matthew Young, who works at the Cornell Lab of Ornithology. Owls generally make their presence known through their vocalizations, which peak two times a year. One is in summer, when fledglings depart their parents’ territory and search for their own. Most young owls have staked their claims by September or October, making November and December relatively quiet in the owl world. But the chatter increases again during the winter breeding season, when mates are courting each other and defending their territories. For great horned owls (Bubo virginianus), the process starts just as the Northeast is settling into the deep freeze of winter. Young told me that by early January the birds, which range in size from 18 inches to just over two feet, start calling to each other. It’s even possible to distinguish the female versus male calls, as the females have a higher pitch and an extra note in the beginning of their call. By February, most great horned owls are incubating their eggs and have grown quieter, although their calls can still be heard as they defend their territories. But as they grow quiet, the barred owls (Strix varia) pipe up. The familiar “who-cooks-for-you-who-cooks-for-you-all” calls become more frequent from late February into April, which is their breeding season. 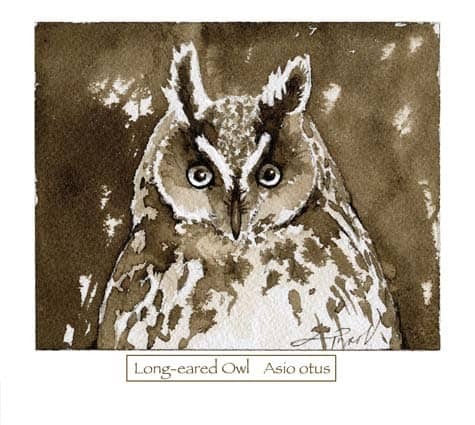 While knowing the breeding season of particular owls increases the likelihood of hearing them, I asked Young if there were tips that might further increase my chances of seeing one. He suggested that I venture out between sunset and sunrise when the moon is bright but the wind is still–ideal hunting conditions for owls. In addition to owls being more vocal in winter, the other advantage to starting my search now is that I might even come across a snowy owl (Bubo scandiacus). Residents of the Arctic Circle, these large birds sometimes irrupt into the lower 48 states, most likely driven by a search for food. Birders were treated to one of the largest irruptions in history during the winter of 2013-2014, when snowy owls were spotted en masse all over the country, including one that ended up at the Honolulu International Airport. While it would be spectacular to see a snowy owl or stumble upon a parliament of long-eared owls, I’ll be pleased just to hear the calls of a great horned or barred. The return of the songbirds may be months off, but this winter will have plenty of moonlit, windless nights, and I will be out there, looking and listening.